Have you ever tasted a dish somewhere away from home that was so good, you immediately thought to yourself, “I must find a way to make this at home”? 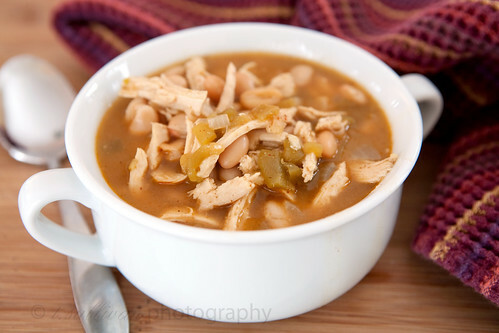 This White Bean & Chicken Chili is that dish for me. I’ve made a few changes from the original, namely omitting the potatoes, but I feel I’ve captured all of the flavors I was trying to recreate with this recipe. Knowing I can make my favorite chicken chili whenever I want now instantly brings a smile to my face. This chicken chili is quite possibly the only reason I’ve survived this seemingly endless winter with record amounts of snow. There’s something about the smokey heat in chicken chili that I find so appealing. It’s as if you’ve taken two of the most comforting foods out there – chicken noodle soup and chili – and combined them into one ultra satisfying and heart-warming dish. As written, the recipe has a subtle but noticeable amount of heat. If you like your chili really spicy, add more chili powder or chiles. Don’t let the BBQ sauce scare you. It’s there to add a touch of smokiness and depth of flavor. In a medium stock pot over medium heat, melt 1 Tablespoon of butter. Add onions and saute until translucent and soft. Add garlic, cook for 1 minute. Add chicken and cook until chicken is heated and chili reaches desired consistency. It is snowing today, so this is perfect! I am definitely going to try this one – it sounds GREAT! Oh this chili looks so delicious! I’m bookmarking this. :) Thank you. I’ve been looking for a good chicken chili recipe! Thanks! chicken chili is one of our favorites! this looks good! I made this last weekend and it is fabulous! Well, it was – we scarfed it right up! I followed the recipe exactly (even used Sweet Baby Ray’s barbecue sauce) and I would not change a thing. (I didn’t add any salt at all- it has plenty of flavor already!) This is such a great alternative for someone like me who loves chili but can’t have the tomatoes. Thanks for the recipe – we will definitely be having this again.